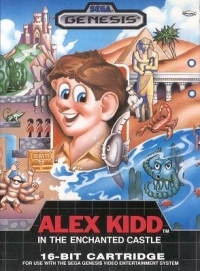 - Alex Kidd is punching, kicking, and leaping through Paperock Planet, trying to save his dad! He's having a tough time, what with scorpions, pufferfish, monkeys, and mummies blocking his way! - Alex knocks down a rock pile and grabs the gold! Every time he gets gold, he's got a better chance to win! Then he bounces high in the sky and dives deep under the ocean to snare more! - Alex gets dragged into a frantic game of Janken. He's got to make the right sign -paper, scissors, or rock- to beat his bully opponent and escape with all of his money! - Alex speeds in his Pedicopter, right up to the Enchanted Castle! Now he can save his dad by tricking Ashra, the ruler of Paperock. But...what's the winning sign?! 02-09-2016 Flashback2012 Box Text *BASH* *BIFF* *POW* - Alex Kidd is punching, kicking, and leaping through Paperock Planet, trying to save his dad! He's having a tough time, what with scorpions, pufferfish, monkeys, and mummies blocking his way! *THUD* *SPLAT* *BOOM* - Alex knocks down a rock pile and grabs the gold! Every time he gets gold, he's got a better chance to win! Then he bounces high in the sky and dives deep under the ocean to snare more! *PAPER* *SCISSORS* *ROCK* - Alex gets dragged into a frantic game of Janken. He's got to make the right sign -paper, scissors, or rock- to beat his bully opponent and escape with all of his money! *UP* *UP* *AND AWAY* - Alex speeds in his Pedicopter, right up to the Enchanted Castle! Now he can save his dad by tricking Ashra, the ruler of Paperock. But...what's the winning sign?! Guess Quick! 11-30-2012 disgaeniac Description "1 Player" "16-BIT CARTRIDGE - For use with the Sega Genesis Video Entertainment System"
11-30-2012 disgaeniac Box Text *BASH* *BIFF* *POW* - Alex Kidd is punching, kicking, and leaping through Paperock Planet, trying to save his dad! He's having a tough time, what with scorpions, pufferfish, monkeys, and mummies blocking his way! *THUD* *SPLAT* *BOOM* - Alex knocks down a rock pile and grabs the gold! Every time he gets gold, he's got a better chance to win! Then he bounces high in the sky and dives deep under the ocean to snare more! *PAPER* *SCISSORS* *ROCK* - Alex gets dragged into a frantic game of Janken. He's got to make the right sign -paper, scissors, or rock- to beat his bully opponent and escape with all of his money! *UP* *UP* *AND AWAY* - Alex speeds in his Pedicopter, right up to the Enchanted Castle! Now he can save his dad by tricking Ashra, the ruler of Paperock. But...what's the winning sign?! Guess Quick! This is a list of VGCollect users who have Alex Kidd in the Enchanted Castle in their Collection. This is a list of VGCollect users who have Alex Kidd in the Enchanted Castle in their Sell List. 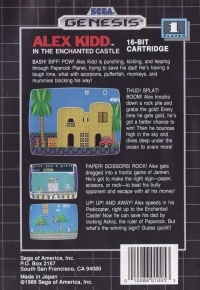 This is a list of VGCollect users who have Alex Kidd in the Enchanted Castle in their Wish List.